I’m not usually up early enough to catch the sunrise, definitely not in summer! Thankfully for me I can capture silhouettes at sunset too! Here is one I took of people fishing at sunset on a beach in Perth. 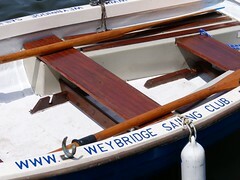 I’m sure I would be banned from Weybridge Sailing Club for using the word ‘Zigzag‘ to describe sailing dinghies tacking across the Thames! I love watching these sailing hydrofoil boats flying along on top of the water! We have been very lucky since we have come back from our holidays as the weather has been lovely & spring is most definitely here. The sun has been shining & we have been out for some great walks.